Casino games specialist, Red Rake Gaming, has just unveiled its latest project, a fantastic video slot consisting of 5x3 reels and an extra magic reel. The game takes place in the Kingdom of Camelot, a place which has witnessed countless battles between brave knights that fought in their quest for the Holy Grail. Now, they are in charge of giving out many more wins to players during the free spins feature. One of the principal characteristics of this new video slot is that it has an extra sixth magic reel. Players can activate or deactivate it during the normal feature and, once activated, there is the possibility to complete wins. The Wild symbol is represented by the famous Merlin and its job is to double the win obtained in the winning lines in which it appears. 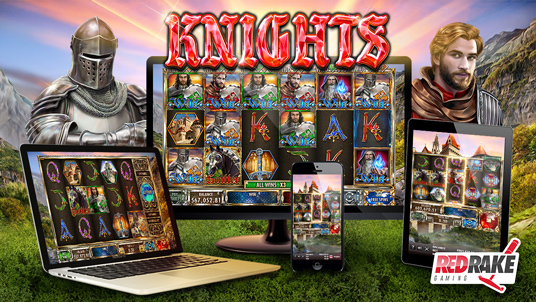 The horse symbol provides up to 40 free spins as a starter to the bonus feature, in addition to its Scatter prize, and if it appears more than twice during this feature it adds extra free spins plus its win while it still appears. During this feature the player also has the chance of multiplying the wins x2 and x3. The game’s climax unfolds during the free spins feature when the 3 knights gradually become Wild as the shields are activated shown in the upper part of the reels. Also, the color of the shield corresponds to the color of the knight. Ultimately, it is an exciting and entertaining video slot where the player becomes involved in an incredible adventure thanks to the reels that don’t stop giving.